Chloe 2008 like Nina and Champs-Elysees is a moniker borrower. It is not a release of the original in different packaging. And along with this new formulation is a wave of disappointed fragrance lovers who expected 1975 Chloe but got 2008 instead. In Bottle: It would be good practice to never approach a name borrowed fragrance or even a re-released fragrance with the expectations that it would even come close to smelling like the original. Nothing but disappointment can result. So I approached the new Chloe with as much open mindedness as I could. And you know what? It was pretty good. The new Chloe mashes together the light sweet peony with clean freesia and other mild, inoffensive and easy to love florals getting a nice, pleasant easy to wear flowery amber perfume. Applied: Chloe goes on sweet and clean the peony and freesia doing its work immediately. There is a touch of sweet fruitiness but the focus of this fragrance is on the flowers. Rose comes in with magnolia tailing behind melding together with the opening notes as the entire scent turns airy and pretty. Chloe is a light yellow dress kind of scent with its sunny, cheerfulness and youthful sweetness. The dry down is a bit understated but still retains magnolia even as the sweet, warm amber heralds Chloe’s departure. Extra: A little known fact about me is that I can never associate peony as smelling like anything else but air freshener. When I was a kid we had some off-brand air freshener kicking around the house. It was some concoction of berries and peonies but the strongest note was peony. If there was any sort of odor or blast of mustiness, out came the peony. One day, after frying a fish, the peony air freshener came out. The rank that erupted. I remember and loathe it to this day. It was a mix of fish, saltiness, burnt oil and sweet cloying peony. Emphasis on the sweetness and the fish. After that little incident we bounced around air fresheners that smelled like rain. 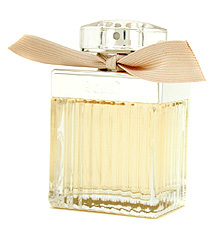 Design: Chloe is bottled in a cute glass rectangular affair with a plastic cap and an adorable little brown bow. The simplicity of this is very nice but in its simplicity the minor details like the textured glass and the little brown bow are pleasant bonuses. Notes: Peony, lychee, freesia, rose, magnolia, muguet, amber, cedar. The new Chloe is all right. At the very least, it is a highly wearable and easy to love scent. The best thing about the new Chloe for me is the bottle. I didn’t much like the old one but I prefer the original Chloe’s scent. Reviewed in This Post: Chloe, 2009, Eau de Parfum. This entry was posted in chloe, floral, Reviews By House, sweet and tagged chloe, floral, fragrance, freesia, new, old, peony, perfume, review, scent, sweet. Bookmark the permalink.